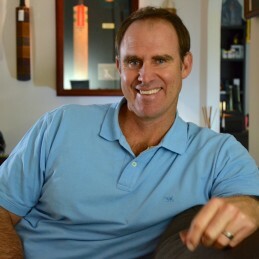 Matthew Hayden is an Australian cricket great. A powerfully built yet decisive left-hander, he was a daunting opponent for opening bowlers as the world’s premier opening batsman during a dominating era of Australian cricket. With supreme confidence, concentration and patience, he was an incredibly consistent performer at the top order and will be remembered in the top echelon of players. A hard-hitting and decisive shot maker, Matthew made his debut in 1993 against England but his breakout was in 2000/01 tour of India where he was a shining light among Australia’s batsmen. He scored 1391 runs in the 2001 calendar year including four consecutive centuries in Tests against South Africa. Matthew was a standout winner in 2002 Allan Border Medal for best Australian cricketer and was also recognised as the best Test Cricketer. Matthew etched his name in the record books with his 380-run innings against Zimbabwe in Perth in 2003, breaking Brian Lara’s record of 375 for the highest run total of all time. Lara would soon reclaim the record but Matthew’s innings is still the fastest scored triple-century in Test cricket history (362 balls). In 2003 Matthew was named Wisden cricketer of the year and in 2004 named in the International Cricket Council’s World Test Cricket Team of the year. 2004 saw Matthew score 1000 Test runs in the calendar year for the fourth consecutive year, becoming the first player in history to do so. At the end of the 2008/09 season Matthew retired from international and domestic cricket. Brought up in the country with a boarding school education, Matthew loves cuisine, the outdoors, and family life. He has written two highly acclaimed cook books. ‘Haydos’ is an active member of the community with involvement in World Youth Day and the Jane McGrath Cancer Foundation. He is an ambassador for the Eat, Well, Be Active campaign and the Fatherhood Foundation.